Having trouble making sense of all the different options in Alaska? Click here! When people think of Alaska, more than a few think of world class salmon, trout and halibut fishing. Alaska Vacation Store can create a fishing adventure for you, whether it is just a day excursion as part of your vacation, or an entire fishing adventure from beginning to end. We work with some of the best professional guides in Alaska, and we also do multi-day fly-in fishing adventures with remote wilderness lodges in Southwest Alaska that specialize in trophy rainbow trout, sockeye and king salmon. Chinook (King) Salmon - The King of Alaskan fishing is the King Salmon. The run starts in most areas in May, and continues into June and July. We can arrange world-class guided King Salmon fishing on the Kenai Peninsula and in the Susitna Valley. Combine your guided fishing with Alaska's best fishing lodges, and you'll have the fishing vacation of a lifetime. 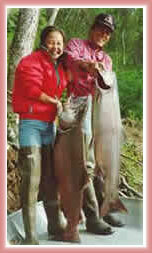 Coho (Silver) Salmon - Silver salmon is one of Alaska's most popular sport fish. Runs generally enter fresh water beginning in late July, and peaking in August and September. These tasty and strong fighting fish are popular quarry for Alaska's fishermen. Sockeye (Red) Salmon - Red salmon runs start in June and continue into July. Most reds are caught using flies. Finding a guide for red salmon may be difficult, but they are easy targets for shore fishermen. Rainbow Trout - Trophy rainbow fishing is available all across Alaska. Many of the fisheries are road-accessible, and others require a flight or a boat to reach them. We work with a number of remote lodges in the Katmai area that specialize in trophy rainbow catch-and-release packages. Halibut - Alaska's favorite saltwater fish is halibut, and charter trips are available for halibut throughout coastal sections of Alaska. 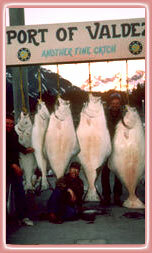 Good halibut fishing is available all summer. Most halibut trips are on small boats with up to six passengers on board. Whatever the size of your party, we can arrange to find you a halibut trip. Our fishing packages are available for almost any budget. Contact us and let us get started on your Alaska fishing adventure today!